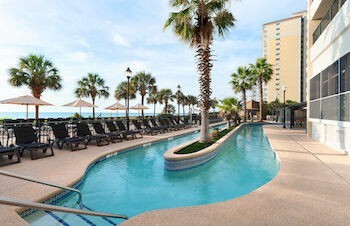 The Breakers Resort is just steps from the sands of Myrtle Beach, and a 6-minute walk from Captain Hooks Adventure Golf. The Market Common is a 15-minute drive downtown, while Myrtle Beach SkyWheel is a 13-minute beachside walk. Ripley’s Aquarium is 6 minutes by car from the hotel.The hotel boasts numerous indoor and outdoor pools, plus a lazy river and a pirate ship, ensuring water-themed fun for the whole family. There’s a kids' club, a fitness center, a sauna, and a spa tub. Guests needing refreshment can choose from 3 restaurants, a Starbucks, and a Ben & Jerry's.All guestrooms come with free WiFi, flat-screen TVs, and free, unlimited DVD rentals. The resort comprises 7 buildings with contrasting views and layouts, with units ranging from 1- to 3-bedroom condos to suites with private balconies and kitchens.